In Ventura County just north of Los Angeles, you'll find California's greatest concentration of places to go camping on the beach. Well, at least near it. Some people might include a beach that's five blocks from the ocean a beach campground, but we don't. If it's on this list, it's next to the beach. Not across the street. Not on a cliff overlooking it. Just Right. On. The. Beach. Many of the Ventura County beach campgrounds are for RVs only. They're suited only for self-contained units that have their own electricity, water, and toilets. Some of them are close to railroad tracks and busy highways, but most people who have stayed in them think the pluses outweigh the minuses. All of these beach campgrounds are within two hours' drive from downtown Los Angeles. Emma Wood State Beach campground is in a gorgeous, seaside location, but it has zero amenities. That means all 90 sites are for self-contained vehicles only and you have to bring your own water and a generator if you want to use electricity. It's a good way to get your RV close to the ocean, but only open part of the year. And it's not quite as nice as Rincon Parkway, a few miles north. For more details, pros and cons and what you need to know, use the Emma Wood State Beach guide. This county park campground has 42 oceanside sites with firepits, hot showers, and flush toilets. Fifteen of those sites have full hookups. Many of them are right next to the ocean. There's also a beach next to the campground that is relatively wide at low tide. For more details, pros and cons and what you need to know, use the Faria County Beach Park guide. Hobson County Park is as close to the beach as you can get without driving out onto the sand. It's small with only 31 oceanside sites with firepits, hot showers, and flush toilets. Ten sites have full hookups. Most people bring their RVs to Hobson, but you can also camp here in a tent. For more details, pros and cons and what you need to know, use the Hobson County Park guide. You may have seen photos of this oceanside RV park and wondered if such a place really exists. It's not a developed campground, just 127 roadside spots for self-contained RVs only. If you camp on Rincon Parkway, you'll hear the surf all night and see birds and dolphins, but you may also hear trains and automobiles. That's enough to put me off the idea, but not everyone agrees. Most people think the natural sounds outweigh the man-made ones. For more details, pros and cons and what you need to know, use the Rincon Parkway North guide. In southern Ventura County so close to the Malibu coast that you could be excused for thinking it's in Los Angeles County, Thornhill Broome State Beach is part of Point Mugu State Park. It has oceanside sites for RVs with cold showers and chemical toilets, but they also have tent spaces. In fact, this is the only place on the Ventura coast where you can set up your tent just feet away from the water and listen to waves crashing all night long. For more details, check the Thornhill Broome State Beach website. 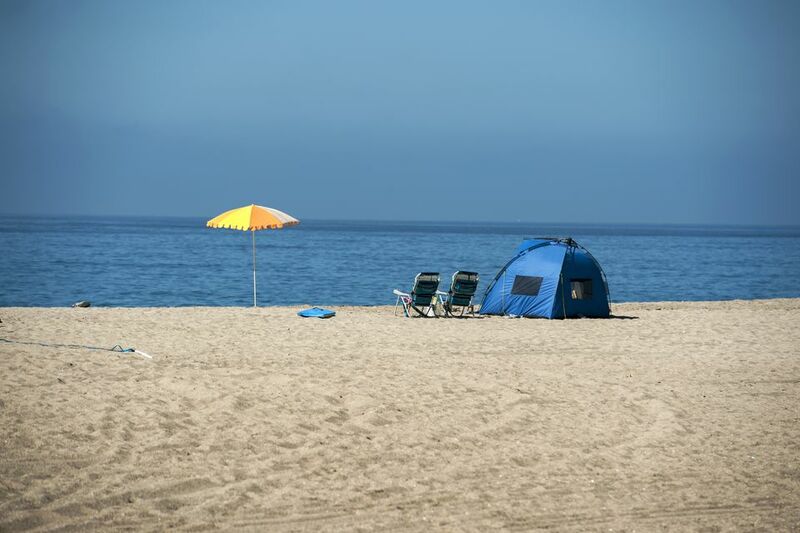 If you love to camp at the beach, you can find more beach campgrounds in California. Use the guide to Southern California Beach Campgrounds to find them in LA and San Diego. You can also find some nice Beach Campgrounds in Santa Barbara County. Further north, check out the options for Central Coast Beach Camping and Places to Camp at the Beach in Northern California.